If you like to shop and booze, this trip's for you. Look at this poor gentlewoman here. Getting there must have been fun. 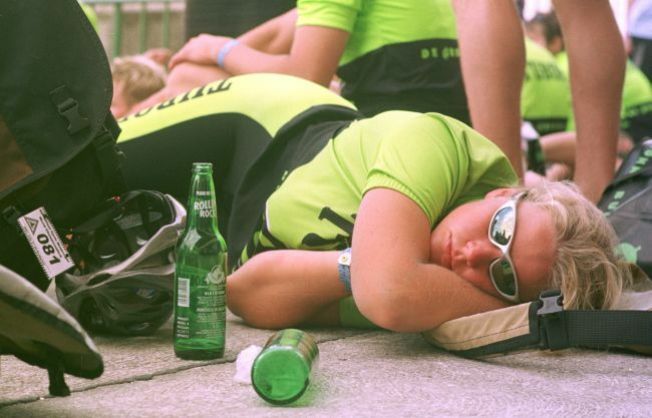 But this won't be you on Saturday's beer-bike ride, right? Is it illegal to drink and bike? If not, what a loophole. Blogging chef duo Hot Knives host the second-annual LA Grand Crew beer-bike ride on Saturday, Dec. 20. The mission: Knock out 22 miles, all your holiday shopping and a lotta booze in the same day. Sounds like a recipe for bliss to us. The plan: Hit up a top-secret list of Hot Knives' favorite stores, pre-burn your beer calories, then guzzle with glee at Verdugo Bar in Glassel Park. You don't have to be a Hot Knife to ride and imbibe. Just $10 gets you premium local brews and veggie eats. Strap your fanny pack on and get drinkin'.